We have climbed five 3,000-foot mountain passes in the last four days. 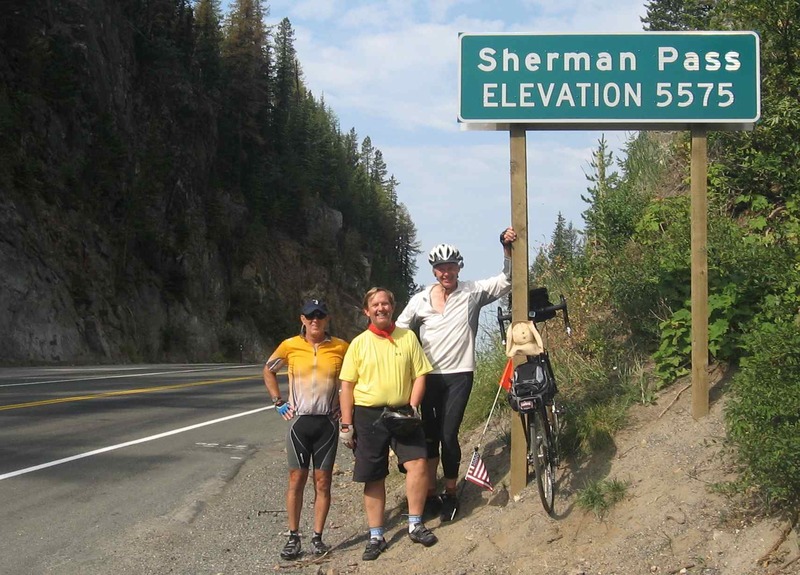 Today we climbed Sherman Pass, which at 5,500 feet is the highest in the state, and it’s our last big climb for a while. It felt like a big day for us, so I put Al’s hat in my bike bag. We started climbing immediately at 7am; it was 16 miles and 3,300 feet to the top. The forecast was for another day of afternoon temperatures above 100 degrees, so we shortened our route to end at the Columbia River around noon. The eastern part of the Kettle River Range is wetter, so there were lodgepole pines and tamarack lining the canyon, horsehair ferns along the road, and the lively sound of O’Brien Creek just below us. It was a Sunday morning road, with virtually no traffic. We climbed fast and within two hours we could see the top, but our surroundings had also changed; instead of large trees, there were vast fields of dead standing timber and young trees growing below them. 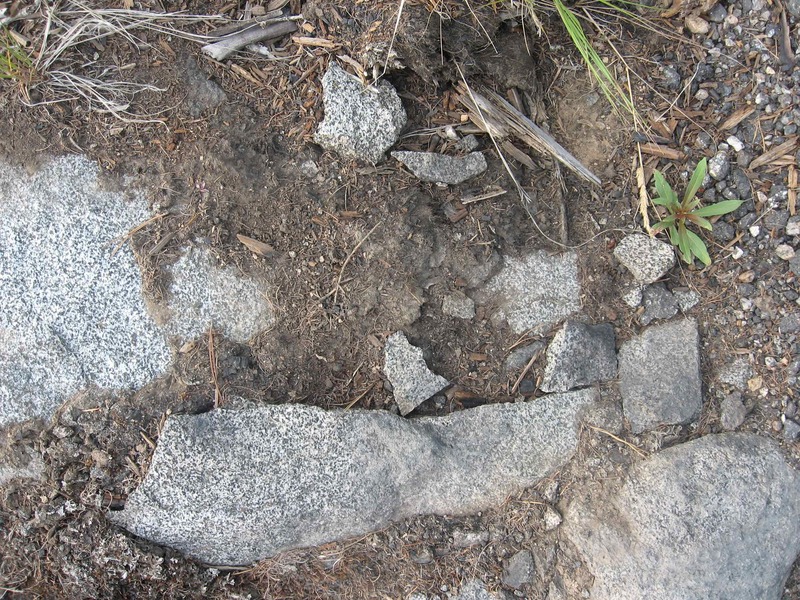 We puzzled over what this could be until we passed an overlook commemorating the White Mountain Fire of August 1988. Lightning started a fire on this slope that eventually burned 21,000 acres. More than 3,000 firefighters worked for 24 days to bring it under control. The kiosk explaining the fire had this quote from US Forest Service crew boss Karen Soenke: “The wind changed direction that evening and our fire grew and began burning in the canopy. Half of our crew was separated from us. We only had radio contact to inform them that we had returned to the safety zone. We deployed our shelters and waited it out.” The heat became so intense that granite boulders in the fire zone cracked apart. 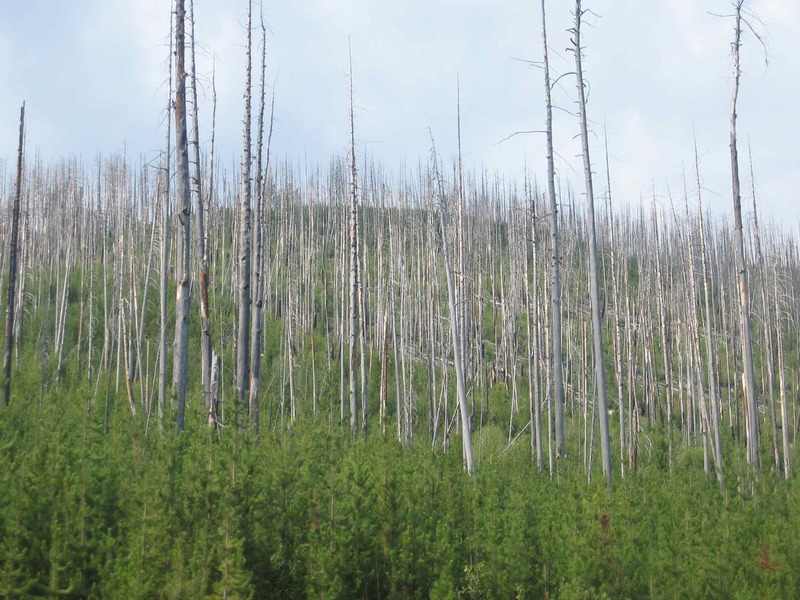 The fire destroyed thousands of acres of lodgepole pines. But the trees are well-adapted to fire, so their cones open and release seeds when heated to 113 degrees. Twenty years later those seedlings are eight feet tall, with their dead ancestors still standing above them. Stands of larch trees were more likely to survive because they have thicker bark and replace their leaves every year, Today they run in dark streaks along the slope below the overlook. The dead snags have become prime habitat for birds like the mountain bluebird and Lewis’ woodpecker. The fire had an impact on public policy, too. Since it ended, the Forest Service has stopped fighting all fires in favor of holding “controlled burns” that simulate the natural fire cycle, or just letting some fires go. Several miles later we were at the top. Bruce Sanford, a guy from Nova Scotia who dreams of going cross-country on a bike some day, took our picture (note Al’s hat). Then it was down and down again, the biggest down so far, but the grade was almost perfectly engineered so we didn’t have to use our brakes more than occasionally. We just steered and cruised at 30 miles an hour; it felt like piloting a plane. Near the bottom I glimpsed the Columbia River through the trees. I had never seen it before. It is really, really big. We reached the Columbia at Kettle Falls. At that point it is a 150-mile-long lake behind the Grand Coulee Dam; we were near the northern end of the lake, which is named for Franklin D. Roosevelt. We rode four miles north to an RV park near the drowned part of the Kettle River, which branches off to the east of the Columbia, and the heat closed in on us like a fist. I floated in the cool water of Lake FDR and thought about how different it is to be an environmental advocate when you live out here. In New York, you can set aside millions of acres in the Adirondacks and prohibit all tree-cutting, damming, or other human activity. You can poke out your chest and brag about how you’re passionately devoted to the “forever wild” clause in New York’s state constitution. You can afford to write off all that water. In the west, if you didn’t dam the rivers, no one would be able to eat or drink. Nature in the west has been re-plumbed so our civilization can exist there. My effort to share your pain by matching your miles has fallen short. Since you began your ride on the 12th I have ridden 174 miles, but that is less than thirty miles per day. Yesterday I did a Canandaigua Lake circuit plus, adding to the ride you are familiar with by turning off of 245 south of Middlesex to climb Flint Hill Road, descend on Sliter Road to Italy Valley, and then turn around and climb Sliter. 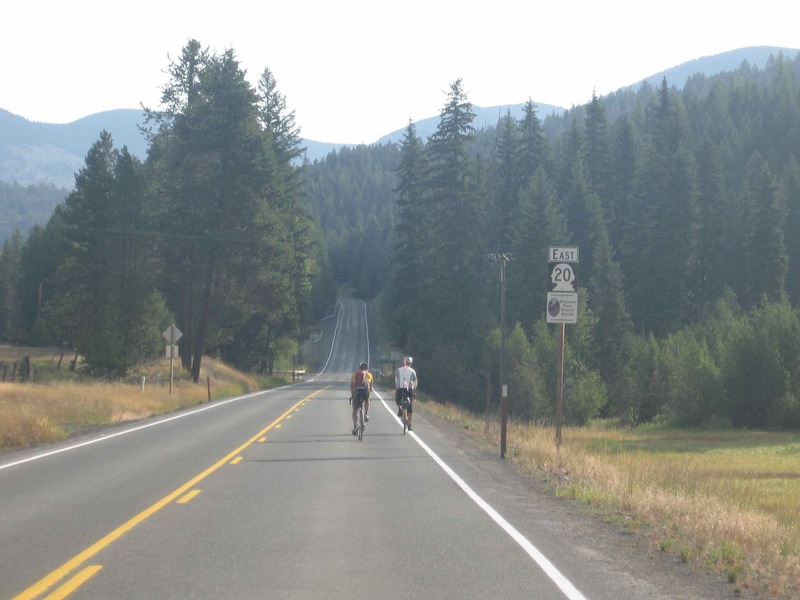 Sliter is one of the three monster climbs of the Highlander and is a steady 15 % for 0.7 miles. Someone had told me that it was worse than Bopple, but I don’t agree. Maybe it seems that way because of where it comes in the Highlander. My ranking of the three monster hills are Bopple, Gannett, and Sliter. I had thought to add a 90 or 100 mile day into these seven days, but don’t think I want to endure that. Today I’ll do the simple around Canandaigua ride. This will give me 220 miles in seven days. This schedule has not tired me to the point that I am not recovered by the next morning. If I had to continue for another nine weeks my main worry would be my right little toe. I must find a way to modify my right shoe to ease that fairly high quality pain. Have you noticed any little (or big) pains? Despite making my living the final eighteen years of my career with agencies (Corps of Engineers and Bureau of Reclamation) delivering that water to the dry west I believe that water development went too far. The Central Valley of California was made into one of the great agricultural production areas of the world, but that concentrated the environmental effects of agriculture to a relatively small area. The environmental effects on the Central Valley include reduced population of various animals, the salmon being the most documented. The concentration of population made possible by the water development has negatively affected the population that it allowed to grow. The traffic and air pollution of the Valley are to the two main reasons I cite for leaving that area when retirement allowed it. 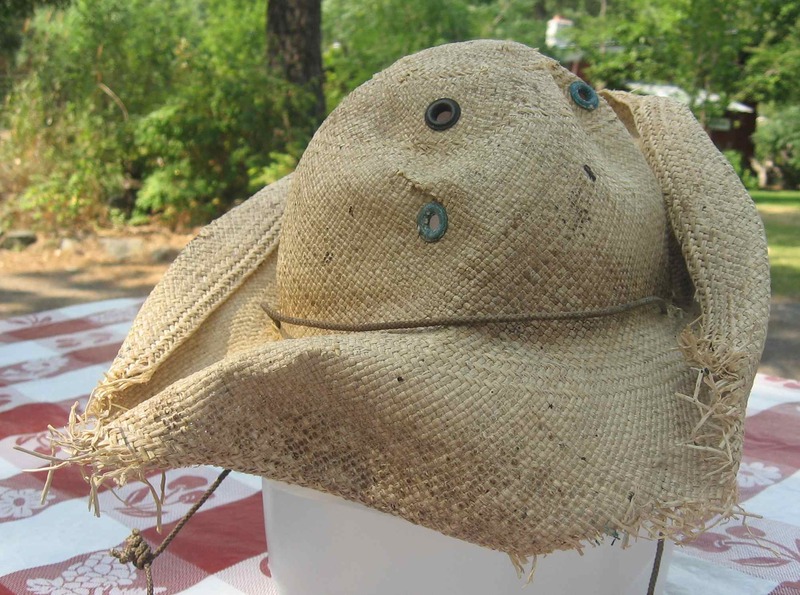 I was touched by the honor of “Al’s Hat” being a part of your trip. Joe and I plan to give a contribution and will do this after we get back settled in at home. I also agree that life and conservation truly varies depending on what part of the country one lives in. I am also impressed by this blog which I think is being managed by Sara. Great job. For all my dear friends who may think I have had this hidden writing talent, the blog is being written by Brad except were noted. For the past 8 days after our long and hot rides Brad, instead of being able to shower and rest like Bill and I, has to run off and find an internet connection and then spend the next 2-4 hours being creative. He is a journalist. He even carries a notebook with him on the bike. He is inquisitive. He spends hours past sunset at the picnic table with a few 1000 bugs doing his trade. We are humbled by his talent and drive. Joe and I are keeping up with your Blog. I knew that the writing was being done by Brad and sometimes Jim. It is easy to see Jim’s personality coming through in his writings. But for some reason I thought perhaps Sara was sending the messages when she was near a place that would allow signals to be send via computers. But perhaps you have a system very similar to what I experienced when sailing on a catamaran in the Caribbean in the Spring. We are enjoying the stories and talk about doing this ourselves via the motorcycle. I, for one would love doing that. Certainly would not have to pack all that impressive stuff that Brad had to pack (smile)!! Joe only allows me one tiny bag on the motorcycle. Thanks for the explanation regarding your friend (?) Peterson. By the way, I loved the way Brad has made it possible for us to click on the towns and places you will be going to and reading about them as well. By the way, would love to know a little about Sara’s and Cathrine’s experiences as the support crew. Sounds like they are doing a great job. I agree with Patty and Joe. I would like to know how Sara and Cathrine are doing. They are probably working harder than the 3 of you. Congrats on making it through the 1st state. How many are left? Don’t worry about the blog, we can go a few days without info. Its not like I check it several times a day…. Well okay at least 2x, once in the am and once before bed. So proud of you guys. Keep up the good work. Rachel…. I am hoping to send you some photos via e mail. ( someday) We are at this tiny City Park in Eureka MT and 6 other cyclist are here and a bunch of rodeo people. Quite a CONTRAST of cultures. But I notice they drink the same beer I like so we have something in common. By the time the night is over I think there will be some dancing in the City Park street. We all share one tiny tiny tiny bathroom which has 1″ of water on the floor all the time. Every time I hit the light switch ( no windows) I wonder if I will light up like a christmas tree. We rode 4 hours today on a road above lake Kooncanusa and had a total of 5 cars. What a gorgeous morning. Have yet to see a moose, bear, or eagle but have seen 100’s of osprey. I can’t tell you how much I have enjoyed reading about your adventures and seeing the pictures. I was especially touched to see that Grandpa’s Al hat is along for the ride. Ride strong and have fun! Following your wonderful progress is truly a great armchair experience! Go hat go! Greg.. the armchair would be the ideal perspective. We are in Seeley Lake Mt and after a day of riding the Swan Valley between the Bob Marshall and Mission Mtn Wilderness we are drying out and doing laundry. We drove this 2 yrs ago and seeing it at 60 mph and 15 mph is no comparison. The biking challenge is less than we expected SO FAR..but the daily chores of tenting ..wet equipment and all that..is more of a challenge than we expected. We should have contracted that part out! ( Sara I think feels maybe she has that job) She does in fact. We are picking up my brother in Helena and he will ride with us for a week + in the Yellowstone area. I think it will be REALLY cold at night. 20’s perhaps at night.